I have seen people (including actual politicians) state that since Brexit, the skepticism against the EU amongst member-nations has fallen, possibly due to what a fiasco Brexit has actually turned out to be. Is this actually true? How is the general state of EU-skepticism in EU nations today compared to a couple of years ago, prior to Brexit? If there has been a change, what are the possible causes for that change, apart from just Brexit? (I wold imagine all of these questions are answerable through polls and elections). YouGov has published 60 polls about Brexit approval over the course of more than 2 years. In the earliest poll, the leave vote was about 1 percentage point higher than the remain vote. In a poll from over 1 year ago, people responded that the UK was right to leave at about 1 percentage point higher than responding that it was wrong to leave. In a poll from 6 months ago, 53% of respondents stated that they want to remain, compared to 47% that want to leave. In the latest poll, 56% of respondents stated that they would like to remain in the EU, compared to 44% stating that they would like to leave. It seems that in the past year or so, more people are increasingly switching from a Leave preference to a Remain preference. This might be due to increasing awareness that Russia conducted an information warfare campaign to influence the initial Brexit vote. Or it might be due to increasing awareness that there will be financial and institutional consequences to leaving the EU. The following article from the polling website pewglobal suggests that EU Member approval of the EU has increased since Brexit. 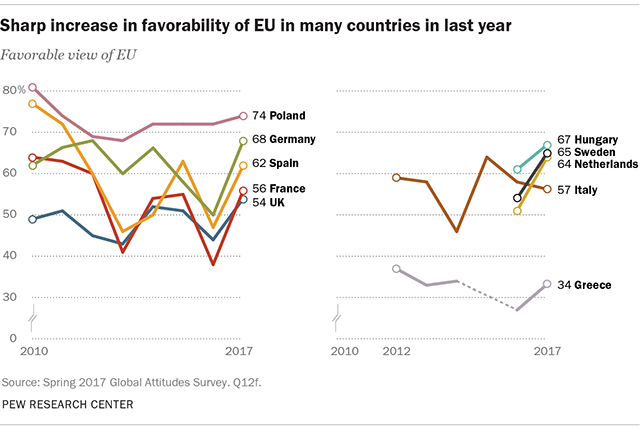 As you will see in the graphic, many member nations' approval of the EU has increased since Brexit, except for Italy. I would conclude that Euroskepticism has clearly declined throughout the EU since Brexit, except in Italy. - Italians under age 45 prefer 46% to Remain and 51% to Leave. - Italians age 45+ prefer 68% to Remain and 26% to Leave. Why would EU governments push for a quick brexit? Why has Article 50 of Brexit not been enabled yet? What is the nature of “Brexit negotiations”? Is there a date (before 29 Mar 2019) when a hard Brexit is inevitable? Has there been a (sustained) downward trend in the amount of EU Commission's press releases in the past decade? Is there an Impartial Brexit Deal comparison site?